The Old Bell was originally a beerhouse that occupied the seventeenth-century stables adjacent to the later pub. In 1930 the New Bell was built to resemble a country cottage with black ship’s timbers, and the postcard above shows it when it was new. In March 1874 Alfred Marlow, a gardener by trade, was landlord of the Bell; he died the following month. 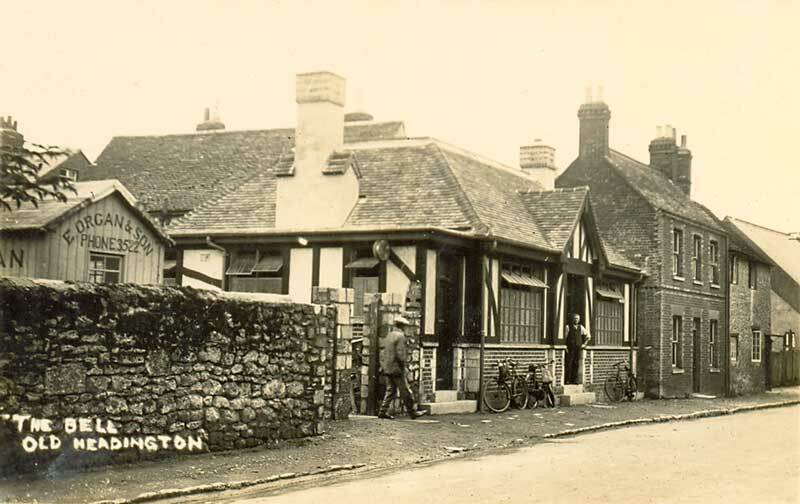 In 1930 John Williams was the landlord of the Bell: this was before Old High Street was renumbered, and its address was then 40 rather than 82 High Street, Old Headington. He was still there in 1936. The 1939 register shows Wilfred Stopps (born 21 November 1900), described as a licensed victualler and a small milk roundsman, living here with his wife Dorothy. In the 1990s a private house was built on the site of the old stables/beerhouse. The pub itself closed in 2000, and was demolished in May 2002 and replaced by another private house.